As we prescribed below that MP HC Civil Judge Grade-II Pre-Examination was conducted on 23rd Feb 2019. After that, the MPHC Civil Judge Result also have declared by the authority. Now, it declared MPHC Civil Judge Grade-II Mains Exam Dates notice on the official website. It is going to hold the mains exam on 26th and 27th Apil 2019. You can check it from testhill.com. MP High Court Civil Judge Mains Admit Card will be available soon on the official website. We will also issue the admit card link on this page. MP High Court released the MP High Court Civil Judge Grade-II Examination date. It is going to conduct the Civil Judge Grade-II examination on 23rd Feb 2019. As we know, the authority has called the candidates to fill up the 190 vacant seats for Civil Judge. The applications were made from 27th December 2018 to 20th January 2019. Now it is going to call the applied candidates for the selection process which is pre-examination, mains examination, and an interview. Candidates need to download their MPHC Civil Judge Grade-II Admit Card to join the pre-examination process. MPHC Civil Judge Grade-II Admit Card is available on the official website. You can check it from this page also from below given link. Short Info: Madhya Pradesh High Court has been successfully filled up the applications. These applications are 245 Vacancy for Civil Judge Grade II and District Judge (Entry Level) Posts. There is a great number of candidates who want to go to the Madhya Pradesh High Court Department. Candidates who have applied for the MP High Court Recruitment 2018 have to appear in the written examination of the Civil Judge/District Judge. The authority has declared the examination date and release the admit card. The examination is scheduled on 29th September 2018 for Civil Judge and the admit card is available on the official website of MP high court. Candidates can download their admit card from the official portal or from this page. The admit card downloading link is given below. District Judge examination is to be held on 2oth February 2019. 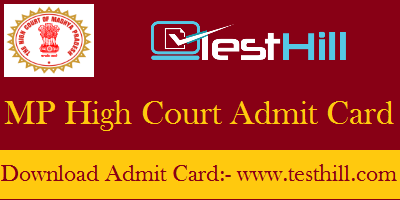 Candidates can download their admit card from www.testhill.com. High Court of Madhya Pradesh has announced the MP High Court District Judge Examination Date. It is going to conduct this examination on 20th February 2019. Candidates who have applied for this recruitment are necessary to participate in this examination. To participate in the written examination, they need to carry their MP High Court Admit Card 2019 on the exam day. Without the admit card, they will not be able to enter the exam hall. So, we can say that MP High Court District Judge Admit Card is an entrance key to appear in the examination. Candidates need to provide some asked information like Application Number and DOB to download the District Judge Admit Card. Admit card is available on the official website of MPHC.